Echoes of Incas: "Ventana Al Sol"
A stirring journey to the Andean mountains by way of pan flute, original acoustic drums and native vocals. 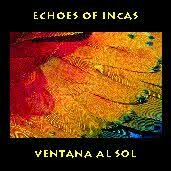 Echoes of Incas has created a new way of looking into this culture with their new album "Ventana Al Sol". The music instills a feeling in all of us that was lost for a time. If you hear the sounds from far away, the joyful upbeat melodies with singing native flute and driving rthythms will stir your soul. Music opens the Ventana Al Sol, "Window To The Sun," to the lifegiving light and warmth to all living beings on earth.